My ever dearest husband surprised me at work. 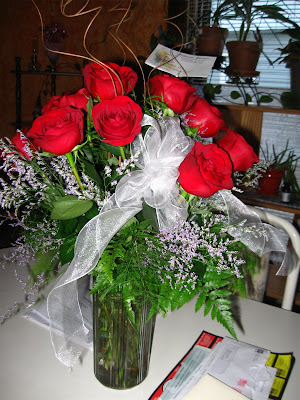 For this very romantic and wonderful flowers I got from him for our 1st year wedding anniversary. You heard me right, it's just like our wedding happens last month that it is already a year old now. Before that happens, I was thinking of calling work and not coming because I was thinking just to spend time at home. But I was having doubts about it, what would I do if I chooses to stay home? Hubby's at work I will get bored. So I decided to go to work, signed an early out for the first day of the bowling tournament. I got at work, feeling tired, bored the calls were totally dead and took me like 3 minutes on every call. Until one of the supervisor asked me to idle 4 and go to the front desk. I wasn't thinking of anything, except of what I did yesterday during punched in and out on my lunch break. I know I screwed it after submitting the CSR exemption form, they shouldn't call me for any reason. I do found a man standing with a bouquet on a vase. 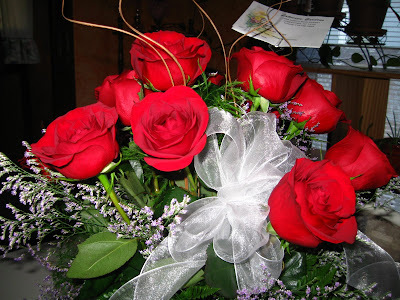 12 dozen red roses with a small note. I felt warm and shaking and probably blushing. Everyone feels aaaaaaahhhhh... and like everyone is smiling at me. I didn't really know what to feel. It is from my husband, yes he sent flowers for me at my workplace. I am very much happy and I couldn't stop smiling. I can smell how nice the red flowers and take it home with me after I got an early out. geeezz.. ka-super sweet man ni bana mommy nov's.. happy anniversary may you have a wonderful and memorable return of your wedding..
wow! that is sooo nice! kainggit! heheheh... congratulations! WOW, grabe ang sweet naman, parang gusto ko nang mag asawa kong ganyan laging me rose na papadala sa office.hehehe. How romantic your husband is, you’re so lucky that you have husband like that. I think that your husband is so sweet and loyal and romantic.